Hello! Welcome to Day 2 of Taylored Expressions September Sneak Peeks! We are celebrating 5 years of TE with a BIG birthday bash! We'll be partying all month long and there will be lots of fun games and prizes to be won during this release week! Tonight is our preview party on Facebook @ 6 PM PST. Please join us here! All products will be released tomorrow, Thursday, September 5, @ 8 AM PST. I have several peeks for you today! 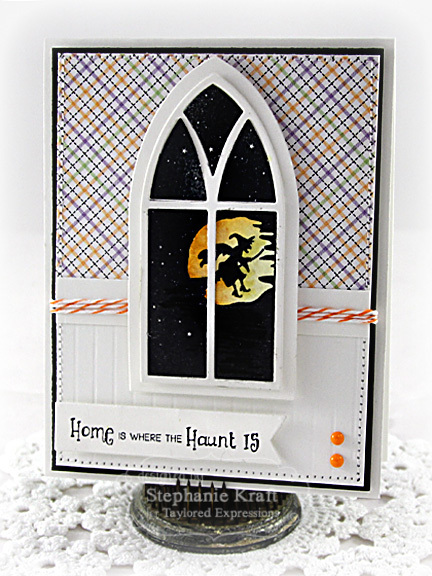 My first one features a new addition to our window-themed stamps, A Spooky View. It coordinates with the new Gothic Window Die (and also Labels Stacklets 5 for those of you who like to add layers). I used the spooky witch scene (one of four images) on my card above. I stamped my image on Choice Watercolor cardstock (using Ranger Archival Jet Black ink). To add color to the moon, I added color with a couple of Distress Markers and spritzed it with Ink Potion #9 to spread the colors around the moon in a water color effect. Next up, I have a set of mini notecards using the new Bracket Notecard die. 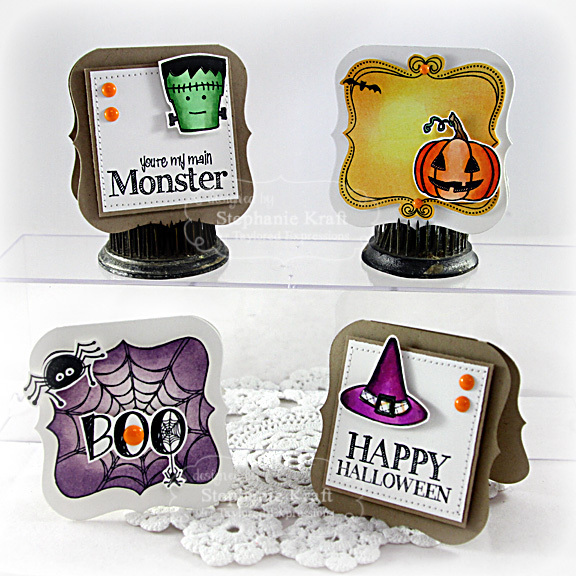 I used various images and sentiments from the newest doodle set, Halloween Doodles. My final project is the snippet that I teased at the top of this post. 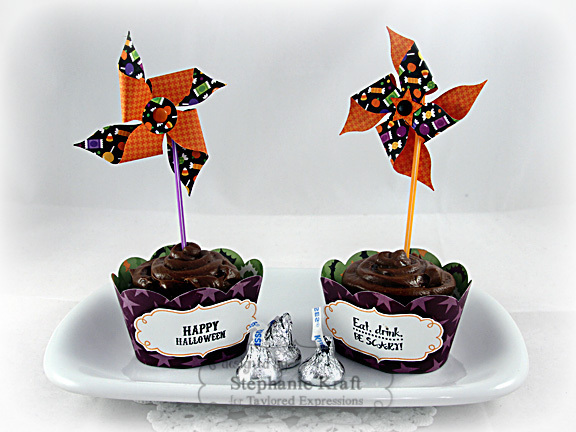 I used the new Cupcake Wrap to dress up some chocolate cupcakes that I made. I added labels to the front of each cupcake. The label is part of a new set called From Me to You (more on how you can get this set for FREE below)! The sentiments are from Bag It & Tag It. 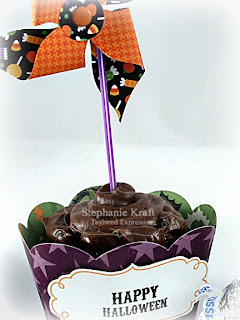 I also used the Pinwheel Parade die to create a couple of pinwheels for a fun decoration. The "sticks" are Doodlebug Pixie Sticks that are so fun and come in a variety of colors. I've used Lilac and Tangerine here. 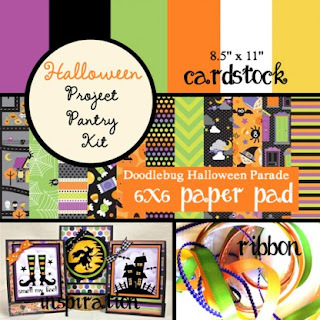 My projects use patterned paper from the Halloween Project Pantry, which features paper from the Doodlebug Halloween Parade collection. And don't forget, there is a new party game today. Today's game is i-Spy! For all the details, please visit Taylor's blog. Accessories: Taylored Dies: Gothic Window, Labels Stacklets 5, Banner Stacklets 1 (TE); Distress Markers: Mustard Seed, Spiced Marmalade (Ranger), Ink Potion #9 (Tsukineko), Divine Twine, Enamel Dots (MME), ScorPal, Foam tape, Thread, Sewing machine. Accessories: Taylored Dies: Bracket Notecard (TE), Markers (Copic), Enamel dots (MME), Foam tape, Thread, Sewing machine. Accessories: Taylored Dies: Cupcake Wrap, From Me to You coordinating die, Pinwheel Parade (TE); Lilac and Tangerine Pixies (Doodlebug), Brads, Foam tape. Those cupcakes look so yummy! I love the indoor/outdoor scene you created and your notecards are adorable! Fabulous projects, Stephanie! Stunning projects today Stephanie! I LOVE your little notecards - they are adorable! You certainly go all out for Halloween! Love all your fun projects but my favorite is the window card - I love those window dies and the way you created the interior with that fun patterned paper. Love the window card and the little note cards are adorable. I just love how you used white for your window frame, Stephanie, and what adorable mini cards!!! The cupcakes are sooo fun, too, with the pinwheel toppers...your projects are all super awesome!!! Love all your fun projects! That window card is gorgeous! Thanks so much for sharing!! Super cute projects Stephanie. Especially love the first card with the black sky and silhouette witch image! Wow Stephanie! What an awesome collection of spooktacular projects! Love all the fun mini notecards! Your little notecards are darling! I can't wait to play with that die! And I love the way your window card looks like the inside of a nice regular house looking out onto a spooky night! Oh my gosh! This post is like a buffet of craftiness! So many great projects - love them all. WOW! I love your card with the choice of lighter colored papers and then the dark window scene. Great job! I also like the use of the die to make the mini notes.